The NSWNMA and the Sydney Alliance are working together to shape the future of Sydney’s health system. In 2012, the Sydney Alliance facilitated improvements to three major Sydney train stations, gained police cooperation to pilot a “stop and search receipting system” and secured the withdrawal of a state parliament bill that would have forced retail workers to spend time away from their families on Boxing Day. Meanwhile, in Sydney’s south-west, six medical centres around Liverpool and Fairfield are upgrading their car parks, thanks to the efforts of the Alliance, meaning patients will no longer have to illegally park when seeking urgent medical attention. 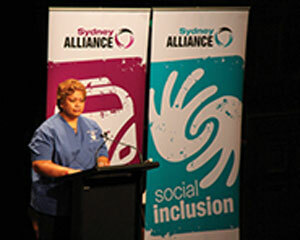 A delegation of NSWNMA members and more than a thousand other people attended the second Sydney Alliance assembly in October. Among them was president of the Quality Aged Care Action Group (QACAG), Margaret Zanghi. “I think action takes a long time and it’s a good thing that the Alliance exists,” Margaret told The Lamp. The QACAG president said she was impressed with the motivation among Sydney Alliance members and described the second assembly as an “extremely well-organised event”. “There were quite a number of members from the Nurses and Midwives’ Association there who were concerned about aged care,” Margaret said. She is hopeful that staffing ratios and pay parity in aged care will be addressed in future through the NSWNMA’s partnership with the Sydney Alliance. “Registered Nurses [in aged care] are not paid the amount that they’re paid in public hospitals and so you can’t attract people into aged care,” Margaret explained. “Most things that go wrong in nursing homes are to do with the fact that there isn’t enough staff on the ground and that’s the main issue. “Things are far from okay and one of the biggest issues is staffing. We need the ratios in staffing,” she said. According to Sydney Alliance organiser David Barrow, the key to solving Sydney’s community support and health service problems lies with concerned individuals, like Margaret, getting involved and taking action. As an active organiser for the Sydney Alliance it’s David’s job to join forces with concerned citizens, community organisations, unions and religious organisations to tackle the big issues plaguing Sydneysiders. “We started with a listening campaign, which nurses took part in,” David recalled. “In that listening campaign, people across Sydney and all the different partner organisations raised three issues: one was transport, one was social inclusion and one was community health and support. “Now we’ve got districts all over Sydney where people can engage and meet people from other organisations, to work together on issues for the common good,” David said. Throughout last year, the Sydney Alliance’s Community Support and Health (CSH) groups focused on improving access to bi-lingual and Aboriginal staff and interpreters in Sydney’s west. The group held extensive research meetings, listening campaigns, organisational surveys and a forum; and plans to trial a “cultural diversity audit tool” at four organisations later this year to, “increase the capacity to recruit, support and maintain culturally diverse staffing”. With the help of the NSWNMA, the Sydney Alliance also petitioned Parramatta Council for additional funding to continue their efforts, starting with a pilot program that aims to engage with aged care providers. While the many issues within aged care have already been acknowledged by the Sydney Alliance, organiser David Barrow told The Lamp that they don’t yet “have a critical mass of people who want to take action on it.